Truth is I don’t even need this damn alarm clock this morning, I am so excited to get started on our hike this morning. I can feel the adrenaline in my body racing through my veins. Along with the excitement and anticipation there is some trepidation. But I really believe this is going to be a great day, and I don’t expect it to be very difficult, I’ve been preparing for months. Our guides are picking us at at 7 a.m. this morning, we had a bit of slow start this morning as our guides went to the wrong hotel to pick us up, so started about hour and half late, but not a problem. 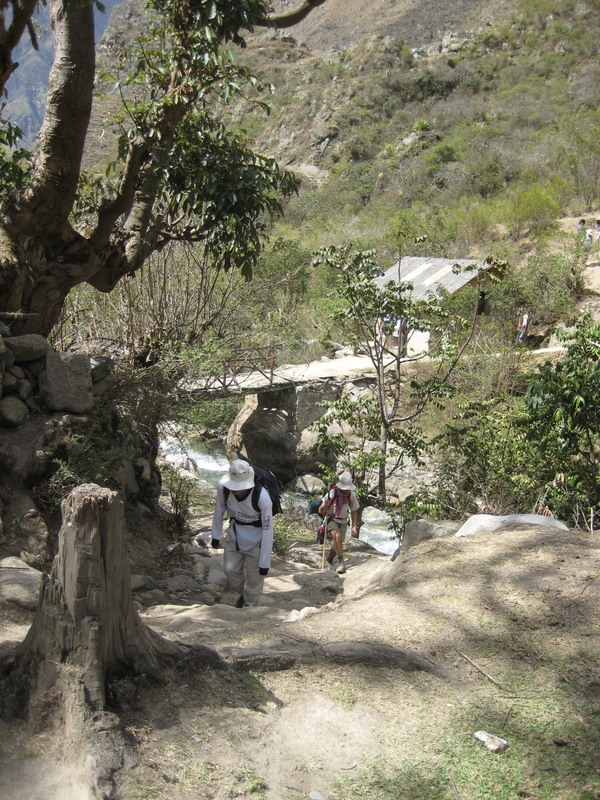 We have a one hour drive to get to our starting point, which just outside of Chilca, we start at Piscacucho KM82. This is where most of the hike’s start, however there is a longer hike available, but we felt 4 days was enough. Now you know there are 8 of us, but our whole group totals about 22 people between us, guides, cooks & porters. Our Guides, Nicholas Apaza and Hernan Hillcahuaman Loayza (say that fast, or at all frankly). For my purpose, we will just call them Nico and Hernan. Our guides stressed the importance of chewing on Cocoa Leaves or drinking as much of the Cocoa Tea that we can stomach, this is suppose to help with Altitude sickness. Cusco is a little more than 11,000 feet, and thankfully we spent a couple of days there, to help with getting acclimated to the altitude. Where we start the trail, it is is only about 9,500 feet, so it doesn’t seem to affect anyone right now. 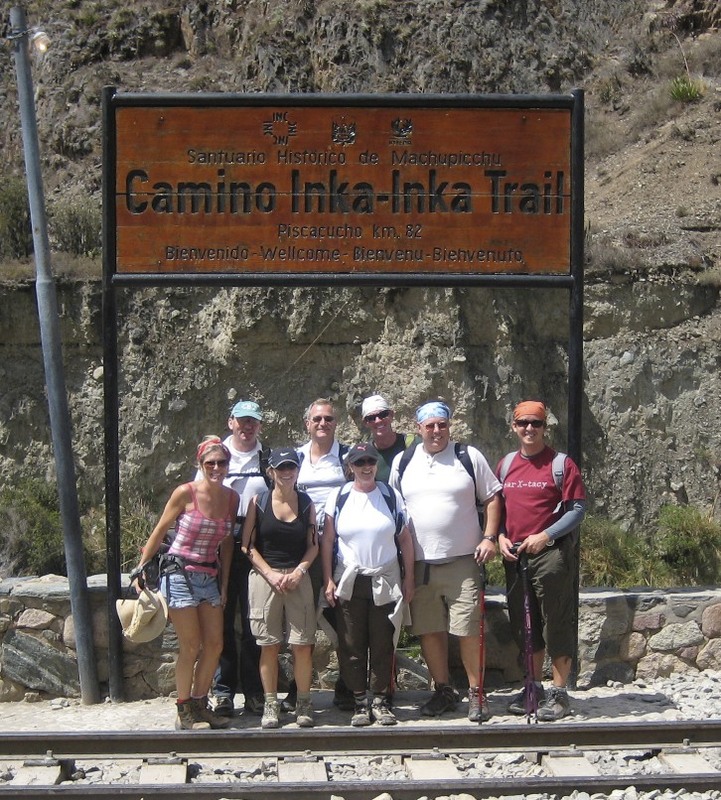 A little information about the Inka Trail…. 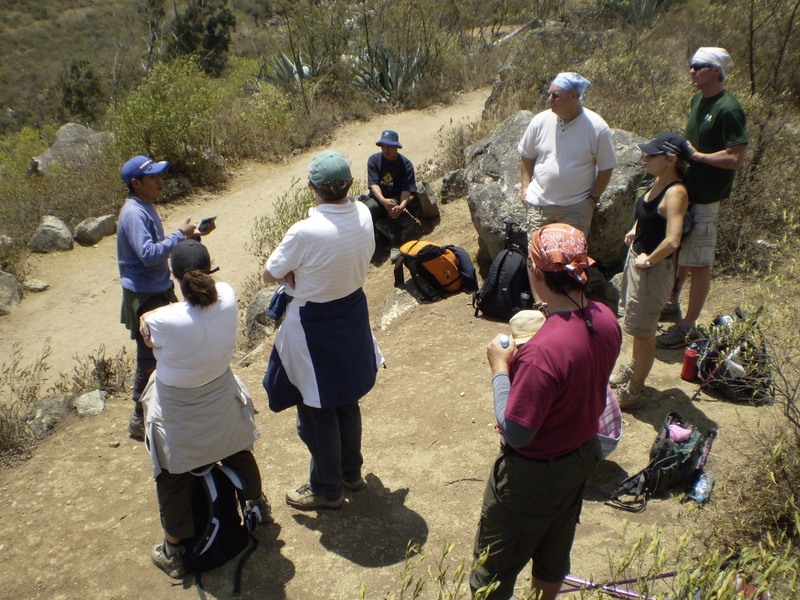 In 2005 the Peruvean government imposed all new rules in an effort to protect the Inca Trail. Now all hikers are required to use a licensed Trail Guide, Porters & Cooks. 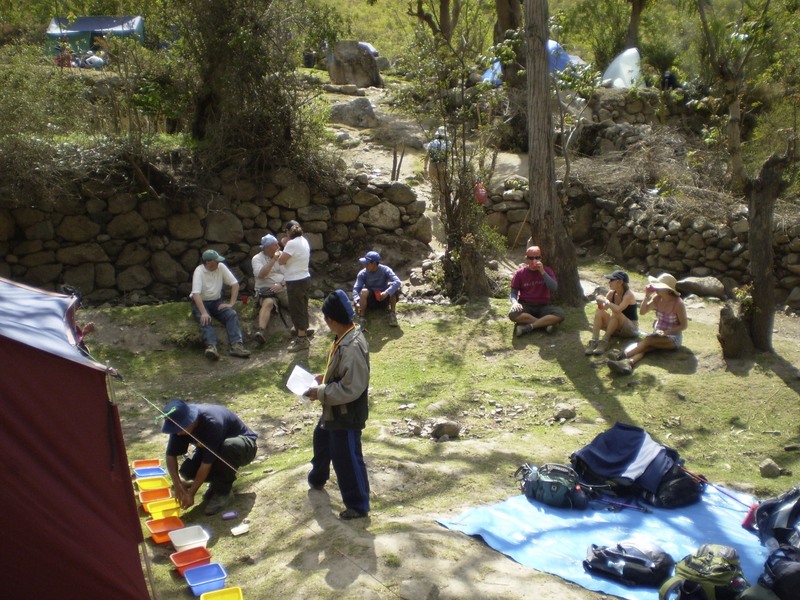 But the biggest change was that they will only allow 500 hikers a day on the Inca Trail, of that 500, 300 are the guides, porters and cooks. So only 200 others are ecotourist hikers. The Trail Guide holds all permits for the group and there are 3 checkpoints along the trail, where those permits will be checked against your passports to ensure the correct people are on the trail and the rules are not broken. The Government has put in place a large number of rules and regulations to protect their ecotourism industry, and from my perspective it is the right thing to do. The guides must be licensed and have attended and graduated from 4 years of university, speak English, and have a complete knowledge of the Inka and Peruvean History and they also need to speak Quecha. Most Inka Trail treks begin at either Km. 88 on the railroad to Machu Picchu, or the village of Chilca, (KM82),which lies in the Urubamba Valley downstream from Ollantaytambo, to which it is connected by a dirt road. The Inka Trail between the Sacred Valley of the Urubamba River and the mysterious abandoned citadel of Machu Picchu is one of the world’s classic treks. Climbing out of the river valley, crossing rugged mountain passes over 14,000 ft high, the trail winds through the Andes, passing numerous significant Inca ruins en route before descending through the Sun Gate to the silent stone city of Machu Picchu. 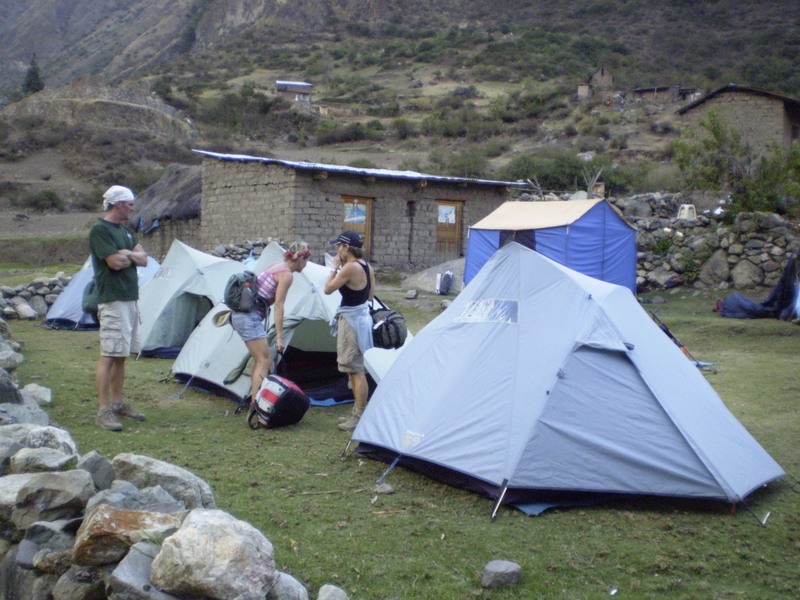 To hike the Inka Trail is a thrilling experience and a very great privilege. But the Inka Trail is much more than a great hike. It is one small portion of an incredible network of such trails crossing high stony mountain ranges, bleak deserts, and raging Andean rivers, tying the Inka Empire together. At its peak expansion, Tahuantinsuyo –“The Four Corners”, as the empire was known– extended from what is now southern Columbia in the north, to central Chile in the south, a distance of about 3400 mi. To rule such a vast domain, the emperor, or Inka, forged a remarkable communications system of approximately 18,600 mi of trails, paved through much its length, stepped where need be, through tunnels where necessary, and using gossamer suspension bridges built of straw ropes to cross rivers unfordable in the wet season. The roads served to move the conquering Inka armies, and were generally wide enough for a minimum of two warriors to travel abreast. A system of runners stationed at rest houses known as tambos sped messages along the roadways, much like the Pony Express mail of the old American West. 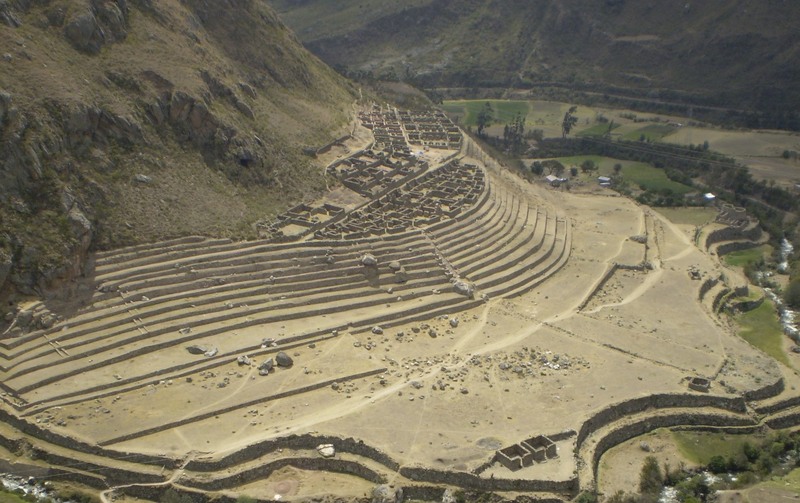 The Inka in his empire’s capital at Cusco could receive news from far away Quito as rapidly as a letter crosses between the two cities in today’s mail. As remarkable as this highway system was in the days when it was built, used and maintained, it is an astounding testimony to its construction that so many segments remain serviceable today, after half a millennium of neglect. Clearly the Inka highway system ranks as one of the greatest engineering achievements of pre-industrial man. Trekkers of the Inka Trail, be it the well-known portion leading to Machu Picchu, or lesser-visited segments, are privileged to make use of an archeological treasure, as well as to partake of scenes of surpassing beauty. 11 a.m., we finally get everyone checked in and we begin. We start from Piscacucho (KM82), which here is an unpaved trail of possibly Inka or post-Inka origin, follows along the left bank of the Urubamba gorge, with views across the river of terraced farmland, snow-capped mountains, a glacial valley with a beautiful example of a terminal moraine, and a small, inhabited Inca ruin. For much of the hike from Piscacucho to Llactapata the rail line is also in sight on the opposite side of the river, and you may see the red and yellow coaches (or blue, in their newer livery) of the train rock by. The first 30 minutes were easy going, the landscape is high desert just like home. It is just spectacular scenery. It is difficult for me to express in words the feelings I have as I watch the scenery go by. I took so many pictures and learned a great deal from our guides. That first 30 minutes must have been driven by excitement, I didn’t even notice how difficult it was, but it didn’t take me long to realize, I was wrong about how easy this would be, I am in for a rude awakening, this is going to be much more difficult. It doesn’t take long before we arrive to our first ruins, which are Qanabamba. 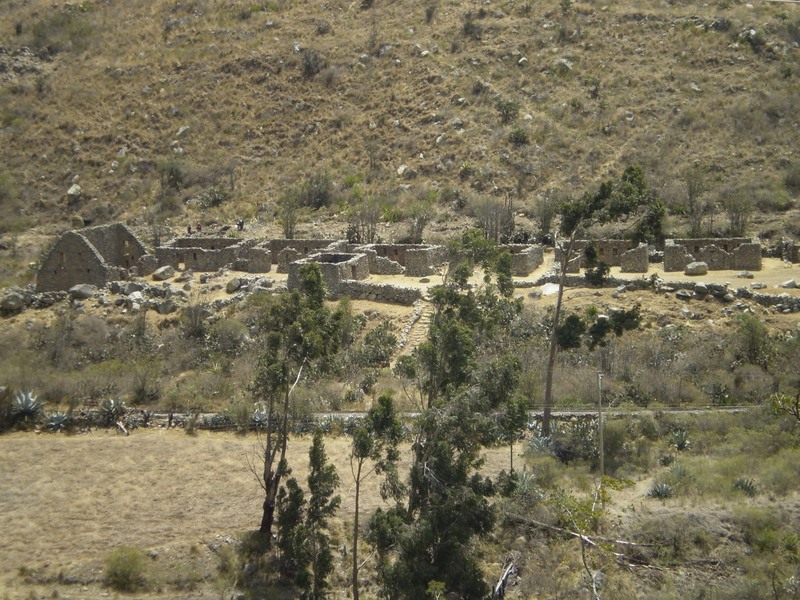 These ruins predate the Inka Empire before 1200 AD. It was basically a village for the farmers to store their crops and made up of small rooms, which would house 6-8 people at a time. After passing these ruins, we had one heck of a climb, just a taste of what is to come tomorrow I am sure. I have been told that day two is the most challenging day. Another 30-40 minutes hiking before we come upon the next ruins, Llactapata. It is really impossible to fully appreciate this site because of it’s sheer size. We were only able to view it from high above so it is difficult to really appreciate it. 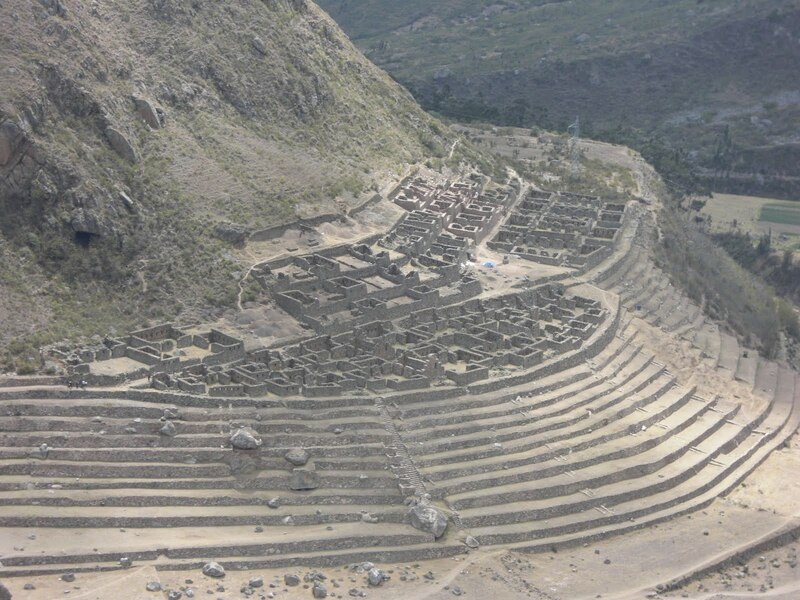 Llactapata (“town on a hillside”) may be unimportant compared to Machu Picchu, but would be considered a major archeological site anywhere else in the world, and is well worth a couple of hours exploring. 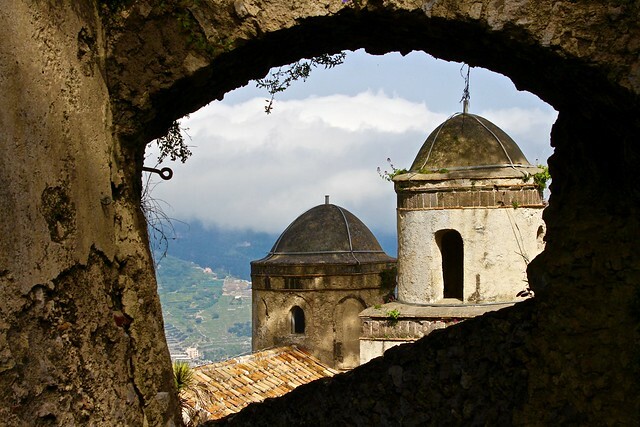 There are extensive agricultural terraces, ruined houses, and an unusual round watchtower-like structure. From here back on the trail to our next stop, which will be lunch. 3:15 p.m., we break lunch camp for our final stop. We have about an hour or so to go before we stop for the night. 4:30 p.m. we have arrived at camp for our first night. 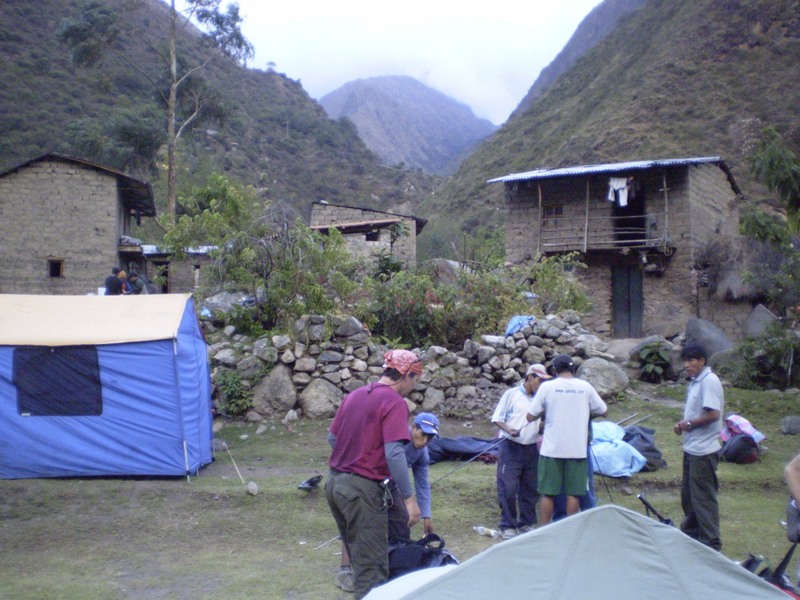 The camp is very rustic, the village of Huayllabamba. the first half of todays hike we were all talking and excited. However after lunch we were all very tight lipped and quiet, very focused on getting to camp. We have been hiking for four and a half hours today. The camp is exactly what I thought it would be, 2 man tents, just camping. The rest of our party were about 10-15 minutes behind us, I am not sure about the others, but I thought the first days hike was a little harder than I had anticipated, however I was surprised that the altitude did not seem to be a problem for me or the others. I don’t know if that is due to the Cocoa leaves or not, but I sure drank as much Cocoa tea and chewed on those leaves to ensure I did not have a problem. I am so proud of everyone, they did great today. Our camp is basically in a small pasture, has cattle roaming all over the place, so you have to watch your step, you know what I mean. And the bathrooms, nothing special, just a hole in the ground, watch your step there too. 5:30 p.m. Camp is finally set up and we take some time to get our tents situated with their sleeping bags etc. We are called for “Happy Hour” which consisted of Coffee, Cocoa Tea, Crackers, Popcorn, Jam, and Hot Cocoa. 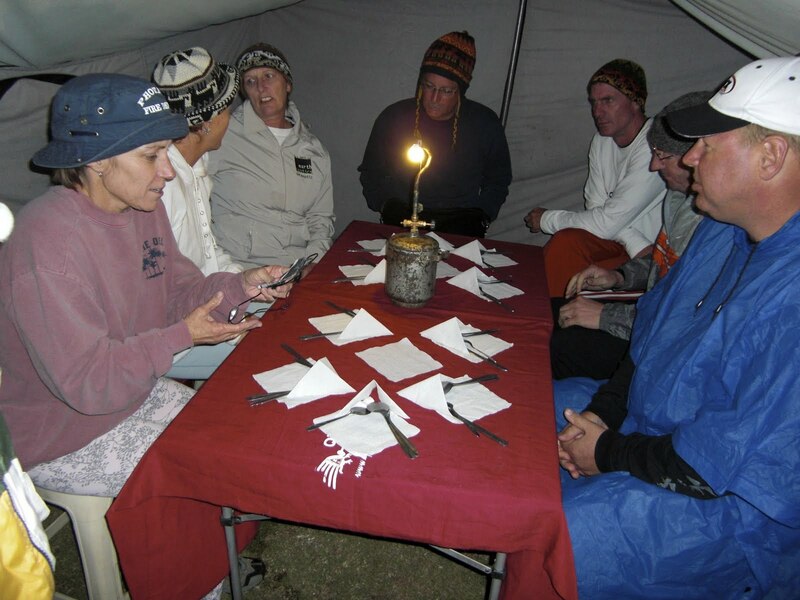 During this time we get our briefing for tomorrow’s hike, which will be significantly longer, more challenging and with elevations up to 14,000 feet. By this time, I have come to realize, I am tired and hope to have a very good nights sleep after dinner. 5:40 p.m. Rain, then some more Rain. We have a light dinner, then off to bed, it is already getting dark. As I lay my head down to sleep, I feel good, happy, excited about tomorrows hike and the beautiful things we are going to see. ← Rage against the Machine…Is Change coming?